Motifs found in block printing draw from the 17th century reign of the Mughal Empire. These motifs, which can still be seen today, are mostly floral, vegetal and animal figures such as elephants and peacocks. 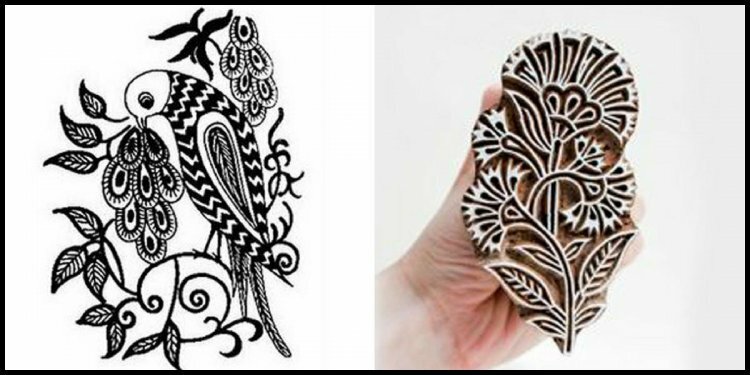 When the art of block printing migrated from Gujarat to Rajasthan and eventually to West Bengal, a wider variety of traditional intricate motifs and colours were introduced. The Indian textile art of block printing had a tremendous impact on 19th century patterns and prints in Britain. British designers of the 1800s found inspiration in Indian floral motifs, of which the Paisley pattern remains commonly loved. Block printing of Gujarat and Rajasthan can sometimes be differentiated by the colours that they use. Gujarati block prints are captivating with their bright colours sometimes printed on a light background, whilst Rajasthani block prints, particularly from Bagru, are often printed on red and black backgrounds. Each hand printed garment created is unique. The Paithapur families of Gujarat passed the art of block printing from generation to generation, forming the trader or sodagiri print, where ‘soda’ is derived from the Persian word for ‘trade.’ The Kutch district in Gujarat was, and still is, a place where block printing thrives. The Ajrak print is said to have originated from this region and is widely used in male garments to this day. Ajrak incorporates, but is not limited to, bright colours such as red or yellow printed on dark blue-dyed or black-dyed fabric. Ajrak prints can be identified by their elaborate geometrical patterns. In Rajasthan, popular motifs and colours incorporate figurative designs of animals, birds, dancing women and Gods in a variation of striking colours. Printers of Persian origin in the city of Bagru and the village of Sanganer are credited for popularising sophisticated floral motifs.